Eye catching decor - check. A huge cocktail menu - check. Instagramable area - check. 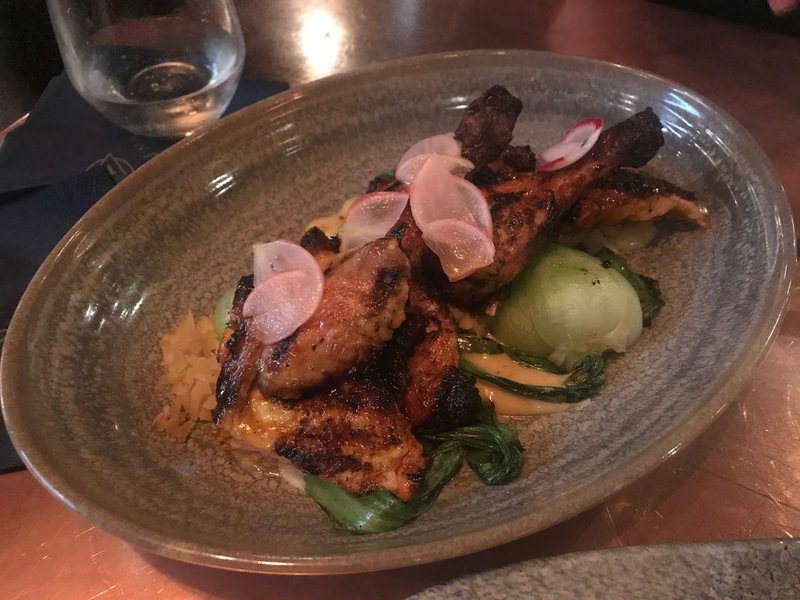 Aluna, nestled amongst the super classy and cool restaurants alongside the canal by the Mailbox, ticks so many Millennial boxes that it would be rude of me to not encourage those in 'my generation' to head along and check it out. Now, this is no normal restaurant. In fact, it feels a bit more like a night out than a Sunday afternoon in a cosy pub. So if you're desperate to wear your new heels and head for a cocktail, or five, with the girls, this is absolutely the place you should be going to. 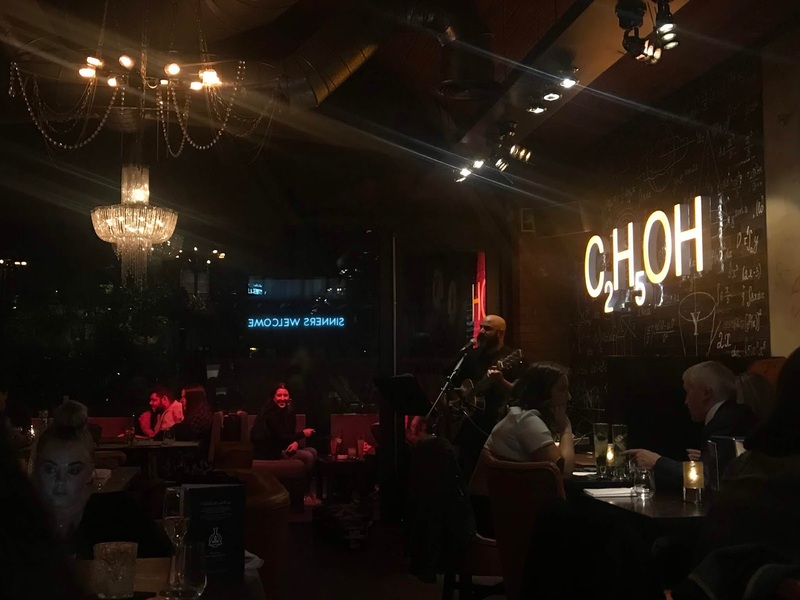 It is the perfect place to start a night out, with an electric atmosphere and cool music, but not so over the top that you can't have a conversation. 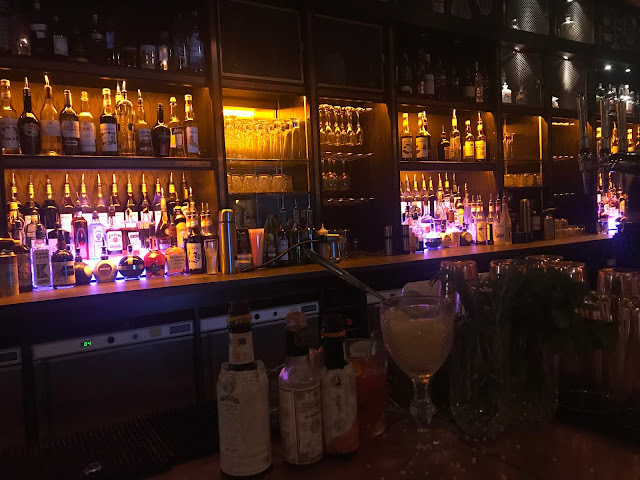 The bar is stacked high with spirits, the lights are turned down low and the venue is scattered with seating for those simply in for a few drinks, and those in for the full Aluna experience. The restaurant feels quite intimate and very, very stylish. 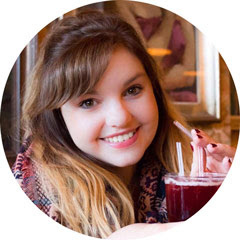 Many restaurants like Aluna have replaced huge main course dishes with sharing plates and small dishes, and it works, especially with enticing people to spend their nights out there - who wants to look bloated in a tight fitting dress anyway?! But Aluna's menu is packed full of flavour and options, and have a wide selection for everyone to enjoy. The Appetisers include Sriracha and Honey Popcorn, Sweet Potato Balls and Toasted Peanuts. However, it's the Plates to Share section of the menu that really makes the menu. The selection includes Red Aromatic Crispy Red Duck Curry, Chilli Crusted Tofu, Mitsuba Fillet Steak and Beef Bulgogi Sirloin. 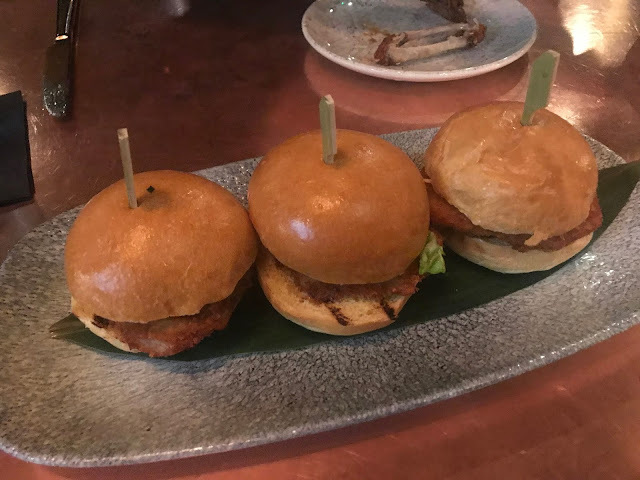 Me and my guest went back and forth for a while choosing, but eventually ended up going for the Chicken Katsu Sliders, which were delicious, and my guest went for the Wasabi Lamb Chops, which were also super tasty. We also chose a small dish each. The Small Dishes menu includes Pan Roasted Scallops, Spicy Chicken Wings and Chilli Salt Squid. I went for the Tiger Prawn Cookies, which came with Coriander, Garlic, Lime and Sweet & Sour Plum Sauce, which were packed full of flavour, and my guest enjoyed the Spicy Chicken Wings, which came with Chilli, Garlic, Shallots and Sesame, which were just a little too spicy for me. In fact, a lot of the dishes looked and sounded very spicy, so if you're not keen on the spice like me, it's worth asking the staff what dishes are mild! We enjoyed both of the dishes alongside a side of Jasmine Rice, which was also delicious and a nice light side. Personally, I don't think this place is going to break the bank, with the sharing dishes costing between £9 and just under £19, and the small dishes costing between £6.95 and just under £12. However, I do think the restaurant has more of a special occasion vibe to it. But in my eyes, that's great! I don't think there are enough places in the city to head to for a special occasion. The decor is incredibly eye-catching at Aluna, and perfect for photographs. 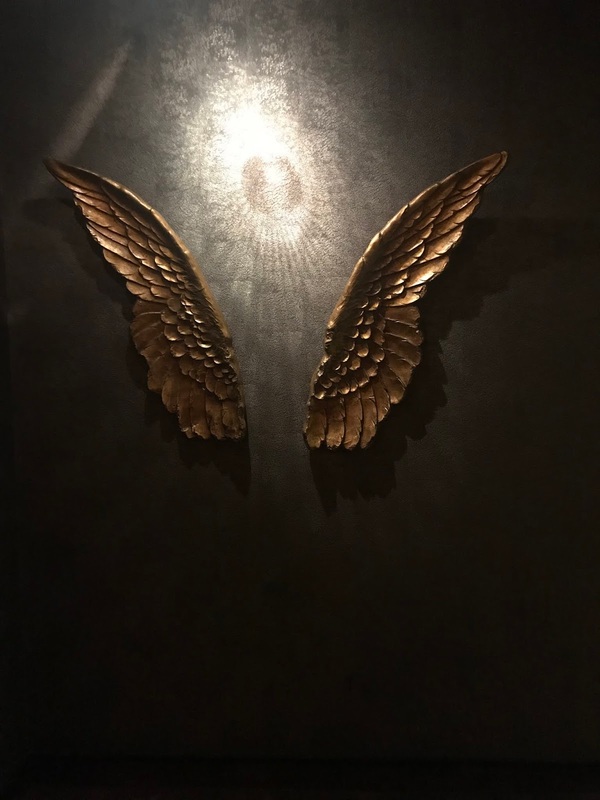 In fact, one section of the restaurant has angel wings attached to the wall, perfect for a night out full outfit shot. Another wall states 'Sinners Welcome', with another wall covered in equations. It is stylish though without being over the top and in your face. Unfortunately, I went along on a 'school night' so I didn't get to try out the cocktail menu which looked incredible. I'd be keen to head along again soon and try more of the sharing dishes, and absolutely a few off the cocktail menu too! If you're looking for a big hearty meal, then Aluna isn't the place for you. But if you're looking for light dishes, alongside a huge selection of drinks, then you are bound to fall in love with the venue. With it also being in a brilliant location, its easy to get to and try out for yourself. It is unique, fun and packed full of cool stuff to look at. Aluna is open from 12pm every day, and is open until 2am on Friday and Saturday.